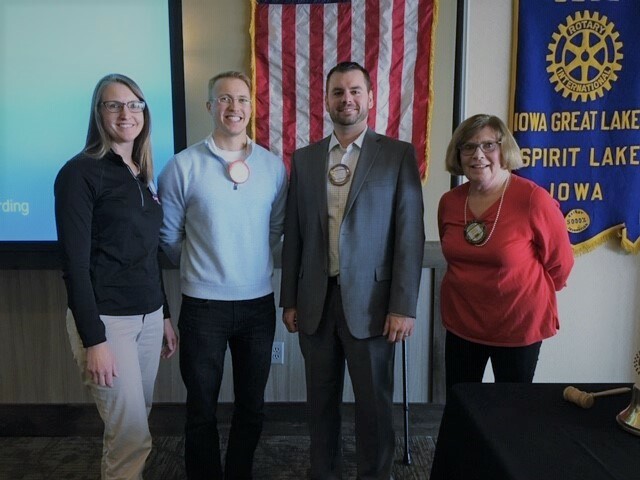 Mick Wiederin Inducted into Iowa Great Lakes Rotary on December 5th. Mick grew up in Bedford, Iowa and attended Central College in Pella. He has a B.S. degree in Accounting and he currently works a staff accountant at Rembrandt Enterprises. Mick resides in the Iowa Great Lakes with his wife, Sara, who is a physical therapist. His interests include anything outdoors including ice fishing and baseball. Mick enjoys the YMCA where he swims and plays basketball. Mick was sponsored by Rotarian Amy Marlow.